I headed up to the Bronx again to meet my friends Damian and Carmel. The plan was to hit a few bars and then have dinner and maybe hit a few more afterwards. We executed the plan well, very well indeed. 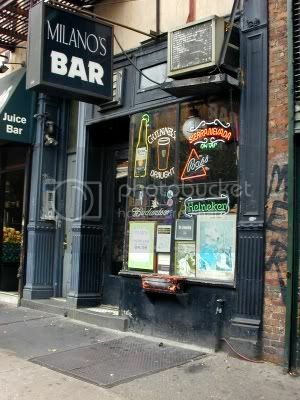 Just as you come down the stairs from the subway at 231st Street you find this old Irish bar. I am afraid my descriptions of the places I visited this evening are going to be, for the most part, a bit sparse. The problem I have when I am out drinking with other people is that I spend too much time socializing and neglect making notes of my observations. A bit of a pity too, because the bars up in this neck of the woods are all real classics. 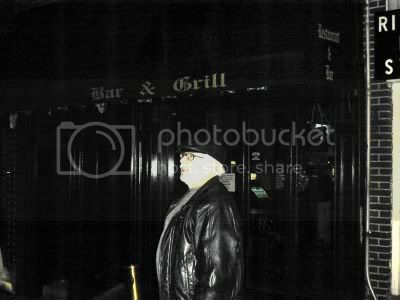 Although my friend Damien, who lives around here, tells me there are a lot few of them than there used to be, the ones that remain have that authentic old neighborhood Irish bar feel to them. 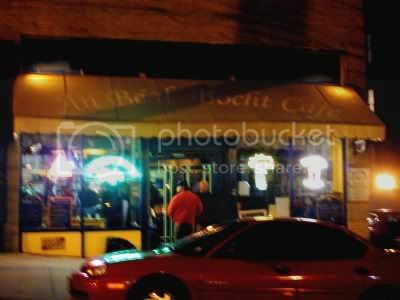 About all that I can remember is that the place had a beat-up wooden bar and was very crowded. One old guy was trying to talk to me about something but I really couldn’t make out what about. There was a lot of old stuff on the shelving behind the bar that held the liquor and on the walls as well. I might have to go back here one day just to take better notes, and because I liked the place as well. 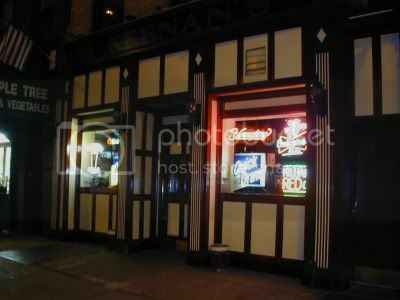 Not far away was this Irish bar that was, to a large extent, much like Keenan’s. It did have a large picture of footballers on the wall along with the name of the bar. Having come to the conclusion that I wasn’t going to be of much use as far as writing descriptions of the bars I handed the duties off to the Mysterious Chinese Woman. Unfortunately, she didn’t start until we got to the next place. 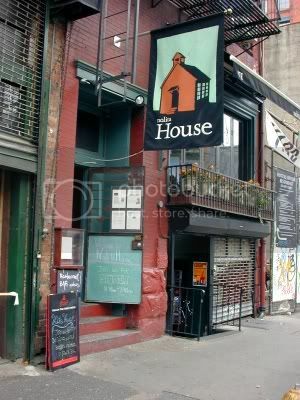 This was a nice Irish pub at 170 West 231st Street that was packed with a very lively crowd. The old wooden bar is U shaped and above the bar is a shelf filled with knick-knacks and a large sign admonishing “Thou Shalt Not Whine.” The floor is dark wood and some of the walls are wood paneled. You can’t really see much of the walls though because the are nearly completely covered with pictures of baseball players. The white ceiling has dark wood beams crisscrossing it which give the place a bit of an old world look. 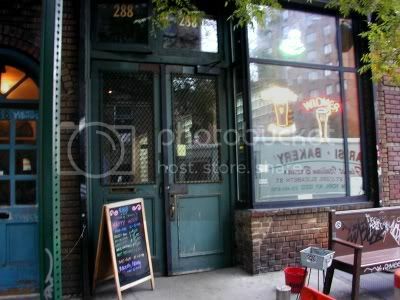 A floor to ceiling wooden beam near the bar has street signs for W. 231st Street, where the bar is, indeed, located. A large green board is mounted on one wall and it lists the menu which consists of pretty standard pub fare. The wooden dining booths near the bar are packed with diners. The food looked and smelled delicious. The place is reputed t to serve great hamburgers. Two doorways on the far side of the bar area lead to a larger dining area in the back. We hopped in a cab and headed to this classy Italian bar and restaurant at 3522 Johnson Avenue. The large picture windows in front are framed with wine red curtains. A large porcelain umbrella stand sits next to the maitre d’s station. Wooden, open lattice room dividers separate the bar from the dining area. More of the open dividers carve the large dining area into more intimate spaces. The wooden bar is long and U shaped. Lots of wicker baskets hang from the ceiling and a couple of oriental rugs hang over the bar area. There are wine racks on the wall behind the bar and two small televisions are mounted next them. I had a glass of wine at the bar before we sat down for dinner. I must say everyone enjoyed their meal. I had oxtail stew and it was very good. Not as spicy as I make it, but this was Italian style and I make my more in the Cuban or Puerto Rican tradition. 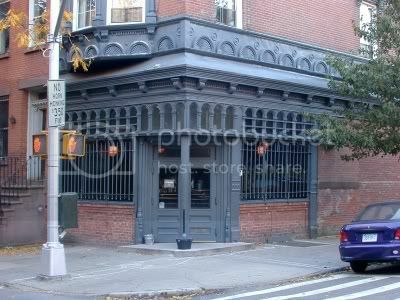 This bar is located at 445 West 238th Street and is another classic. The name means “Bad Mouth” in Gaelic and refers to someone who complains too much. 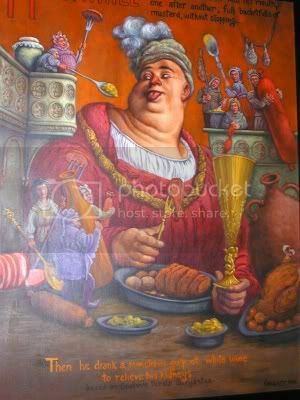 There is a large painted mural on the wall behind the bar of an old woman bending over a large black iron pot set inside a fireplace. Perhaps she is the complainer. Next to the L shaped wooden plank bar are shelves holding cans of beans, bottles of salad dressing, and bottles of Lucozade, an energy drink. Now why you would have a grocery store inside a bar is anyone’s guess, but I guess they do sell specialty Irish products to their Irish customers. 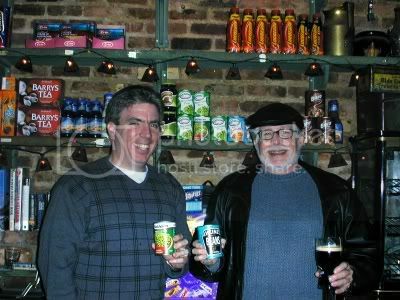 Hanging above the shelves is a large picture of famous Irish writers, Joyce, Beckett, O’Brien, Behan, the usual suspects. A band was starting to set up for live music when we walked in but we couldn’t linger to hear them play. We had one more stop to make before heading home. Kind of minimalist furnishings in here, The tin ceiling is painted black with a small inflated airplane hanging from it to provide a splash of color. The lighting is provided by a couple of clear glass pendant lamps. The walls are painted raspberry red and the floor is covered with brown tiles. The wooden bar is L shaped and has foot railings constructed from metal pipes painted black. There are no cabinets behind the bar, just two very large mirror with a counter underneath that holds the liquor bottles. The front wall is made up of glass doors that can be opened up accordion style when the weather is more accommodating. The owner, Mike, was there and while chatting with him I discovered that he knows Dave, the owner of Pioneer where I will be marking my 1000th bar. I had a Guinness and then headed to the subway for the long ride home. A very good night indeed. Lot's of fun and 6 bars hit making 953 for the year and leaving 47 more to go. After this is over I am going to have Damien and his crew visit me in my neighbor hood so I can show him around. 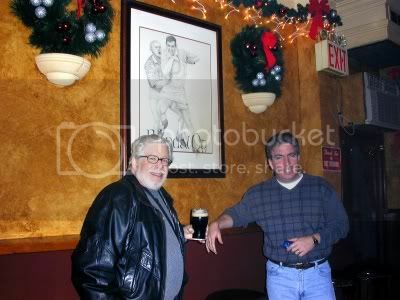 He does an excellent job showing me the Bronx and many truly great bars. 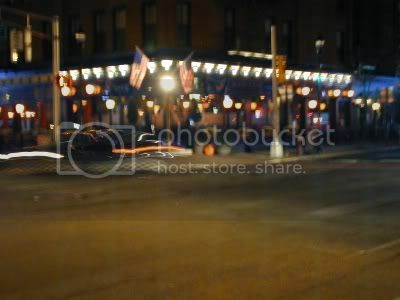 I headed over to Hoboken to meet my friend and visit a few places. Got off to a bit of a later start than I had anticipated so only got to stop in a couple. Quite a walk from the Path, let me tell you. I picked a place to meet my friend that is just around the corner from here and had forgotten the street numbering system. I knew The Madison Bar & Grill was by the water and mistakenly assumed it must also be by the Path and the ferry. Wrong. I was off by about a mile. Oh well, I needed the exercise. This place had a nicely worn oval wooden bar open at one end and with a brass rail running around it. The bar chairs were wood with green patterned fabric seats. 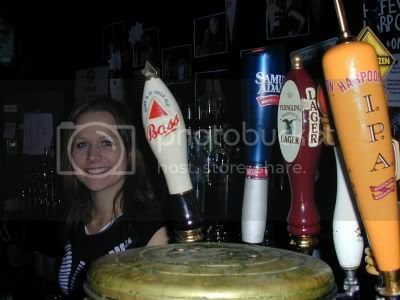 There was a silver T shaped bar station on each side of the bar and each had 6 spigots. Neat cone shaped blue lights hung over the bar. The serving station in the center was oval shaped as well with shelves for bottles and glasses and tiered shelves of liquor on top. On one wall was an interesting mural of people lounging next to what must be the Hudson River and Lady Liberty taking a refreshing dip. The opposite wall alternates brick sections with yellow plaster and is lined with low oxblood colored banquettes and little tables. 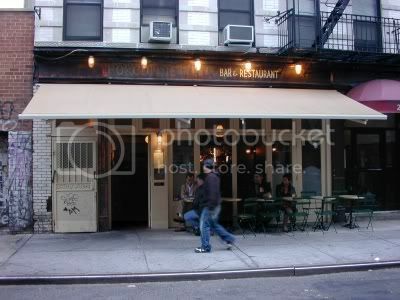 There are also several small tables with chairs in the area between the front windows and the bar. Lots of televisions around the place and screens for projections televisions at each end of the space. 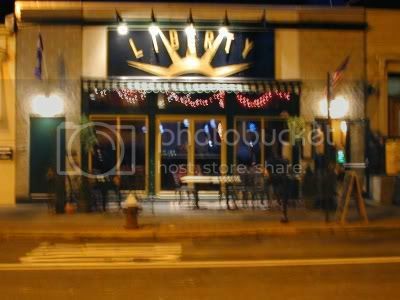 Strings of little orange lights were wrapped around two small black metal beams towards the fronts between the bar and the tables up front by the windows. There are a few small mirrors and sports photos on the wall towards the back. A large neon Liberty Bar sign, courtesy of Bud Light, hangs high above the bar. 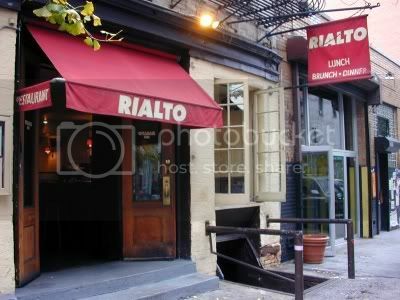 A classy restaurant with the major dining area in a room separate from the bar. The bar is quite long with a white marble top with just a small section at right angles at the end by the door that has a wood top. There is a brass rail and wooden bar chairs with brown vinyl seats. Two bar stools with the same type of seats sit in front of the wood topped section. Orange inverted dome shaped glass lights hang over the bar. The place was almost empty when I got here but by the time my friend, who asked that I refer to her as the Mysterious Black Woman, got here the place was packed, and I mean packed. Not just the large front area by the bar but the fairly large dining room as well. Everyone seemed to show up for the two-for-one Happy Hour. The bar back is fairly elaborate with old looking wooden shelves, cabinets, and drawers down below a ledge and tiered shelves of liquor. The drawers and most of the cabinets have wooden fronts but a couple of coolers have glass doors and there is also some open shelving that holds more liquor. There are mirrors behind the liquor on top and on a ledge above the mirrors are several televisions and smaller wood framed mirrors with drink specials written on them in white. Windows wrap around two sides of the place with the bottom halves frosted. The long side is lined with tables with white tablecloths and candles. There are a couple of overhead fans with orange domed lights below and a large light fixture with a couple dozen small lights with orange shades. The outside is ringed with what looks like old-fashioned streetlights that are also orange. 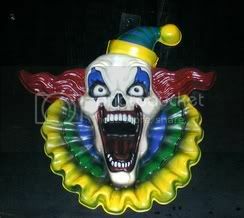 This place would be great on Halloween. There is a large American flag mounted on the back wall and small black and white photos of what look to be old time jazz musicians. 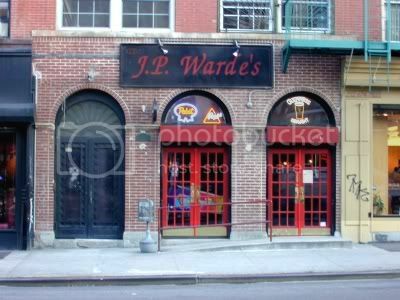 I had a Dewar’s and soda at the bar before heading to the dining room. Not a bad day, two bars hit bringing the total to 947 for the year and leaving 53 more to go. I wish I had gotten here a bit earlier so the pictures came out better, but what can you do. Hey, there are so many great looking bars in this neighborhood that I just had to go back. 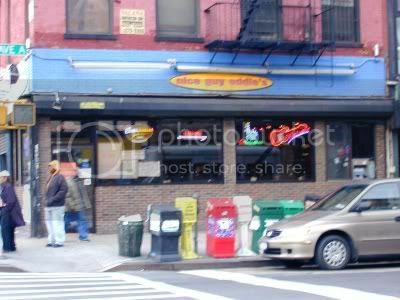 In fact yesterday when I was at Nice Guy Eddie’s I spotted the three I went to today, one right next door and the other two across the street. Two of the three of them are owned by the same guy that owns Nice Guy Eddie’s and Vasmay. He must like the location. This place is the one right next door to Nice Guy Eddie’s, on Avenue A and just off Houston. It has that standard boxcar shape to it with a long beat-up L shaped wooden bar that has a metal kick panel on the bottom of the sides and a brass rail. The bar chairs are kind of an assorted mixture and pretty beat-up. There are two beer stations, one brass and one silver, sitting on the bar and they have a decent selection of both draft and bottles. Strangely enough though they were out of my first choice of both a draft and a bottled beer. I thought it was going to turn into a Monty Python like sketch for a minute there. Large orange and purple Japanese paper lanterns hang above the bar. The bar back has got mirrors, a cabinet with old leaded glass panes, tiered shelves of liquor and a pleasant amount of clutter. Down below are cabinets, some with open shelves of liquor and others with old wooden doors and narrow drawers on top. The décor in here is, well eclectic is an appropriate word. On the shelf above the bar are old books, a couple of skulls (one nicely glowing), some skeletal hands, globes in various shapes, strange portraits, a bust of Mozart or Beethoven (I can never keep them straight) one of those heads showing acupuncture pressure points or something that you see in the windows of Chinese pharmacists. 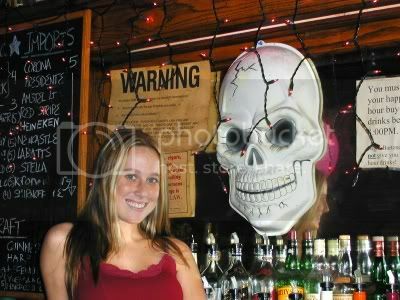 Small pink lights are draped over the mirrors and there are large plastic skulls on the mirrors. I was assured that these were not just left over from Halloween. The walls are dark red and a bit grungy towards the bottom. There is a small white screen in the back and the bartender says they show movies with no sound at night. Ah, the bartender. Her name is Jaime and she was quite friendly. That must be a requirement for working in the bars that this guy owns because the bartenders in all of his places seem even friendlier than usual. As I was there an interesting assortment wandered in and out, some even staying for a drink, but mostly to say hello to Jaime. I had a bottle of Magic Hat #9. The bartender suggested that when I hit bar number 999 I order three of them and have my picture taken with them lined up. I think that is exactly what I will do. Well, I would go on about the friendly bartenders (this place is the other one owned by the same guy and is right across the street) but I have already talked about this one, it was my, by now, old pal Elisha from Vasmay. I felt right at home even though it was my first time here. There is a long wooden bar with one of those raised ledges in front and a fairly ornate heavy wooden front. Another cast of characters were sitting at it and once again everyone was very friendly and chatty. If I lived around here I would probably never spend any time at home. The bar back is old, fairly elaborate wooden cabinets, quite old looking, with glass mirrors largely obscured by bottles of liquor on tiered shelves and photos of customers. Pink and orange feathered boas and strings of small multi-colored square and round Japanese lanterns hung above the mirror. A large plastic alligator eating a smaller one also hangs in front of the mirror at the far end of the bar. Some large fluffy flowers decorated the area around the cash register. Sitting on the shelf above the mirrors are chalk boards listing the beer specials, an old and almost destroyed (the way the should be) accordion, an old green and yellow tow John Deere tractor, the kind a child could ride in, a pair of bodiless legs, and an old suitcase that looked like it had wandered over from Vasmay. They don’t serve food here, but according to a sign on behind the bar they will "Grease UR Turkey on Thanksgvn” with $3 pints and well drinks and $5 wine. The walls are kind of a pumpkin orange above wood paneling and red padded benches with tables and chairs in front of them. The entry way is glassed in and this forms two alcoves, one on each side, by the windows next to the door. There are benches with tables and chairs in these as well. 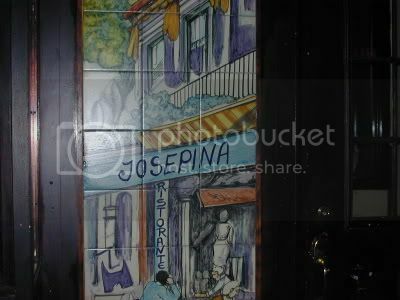 An old cabinet with frosted glass doors and narrow mirrors on the bottom hangs on the wall opposite the bar. The back wall is old wood with a large scythe and a picture of an old Cadillac hanging on it. Hanging on the wall leading to the back are a series of black and white framed portraits that I assumed were taken by a local artist. There is a pool table in the back with a blue Bud Lite sign hanging above it. I had a pint of Boddington’s and a generous shot of Bushmills. I could easily have stuck around for awhile but I had gotten of to a bit of a late start and I still wanted to hit the bar next door. I felt kind of sorry for this place, because even though the bartender was pleasant enough he just wasn’t competition for his neighbors. The place was empty except for a guy at the pinball machine when I got there and stayed that way until one of the guys that was in Library Bar wandered over. We sat around and talked a bit and the bartender joined in so all and all it was a pleasant enough stay. The day was growing darker though and this bar was very dark indeed. The primary source of light came from red light bulbs in upside-down galvanized tin buckets painted black on the outside that hung above the bar. I think it would be safe to say that you could develop film in here without risk of over exposure. There was a nice sized old wooden bar with a brass rail and old wooden bar chairs. A metal T shaped beer station with a half dozen spigots sits on the bar. The bar back appears to be fairly plain but, I have to admit, it is too dark to really be able to tell. There are mirrors and tiered shelves of liquor and glasses. Two small carriage lanterns with dim flame-like bulbs flank an American flag partially obscured by beer bottles and a framed J.P. Warde’s tee-shirt (only $15, frame not included). There is an NBA Fastbreak pinball machine up front that was so loud I thought it was going to drive me out of the place. It turns out the guy wasn’t playing it, he was servicing it. Once he was done and adjusted the noise level it actually went quiet. Kind of a strange spot for the pinball machine though, right up front by the windows. Usually you would expect to find it in the back. There was a pretty neat Foosball-like hockey game next to it. There are a lot of horse racing themed pictures on the red walls above wood paneling. 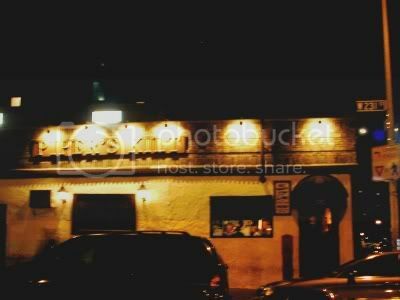 The bartender said that the owner of the place plowed his profits into land in Ireland and had some race horses over there. The pictures on the wall just opposite the bar were strange looking cartoon like pictures that kind of invoked the image of Speed Racer if he was a jockey. They were kind of neat. They were hosting some kind of an art show in here and at least one of the pieces of art was a round abstract painting that had been done by one of the guys that had stopped into the Library Bar while I was there. There is a pool table in the back covered in red felt. The ceiling is sagging metallic gray tiles and the floor is old wood. I had a Widmer Hefeweizen and a shot of Jameson. They were out of Bushmill and I found out that the reason so many places were out of certain liquors was because of some kind of a strike by the liquor distributors. It had just ended but some of the bars hadn’t gotten their shipments yet. Just as an aside, you may remember the guy in Vasmay who wanted to buy his own bottle of Jagermeister because the bar was out. Well, at least according to Jaime, every bar in the city had run out of Jagermeister. I guess it really is popular. I also found out that it is illegal and there is a big time fine if you a bar is caught buying liquor from anyone other than an authorized distributor and selling in the bar. The distributors really do have a lock. The bottles are marked so you can identify where they come from. 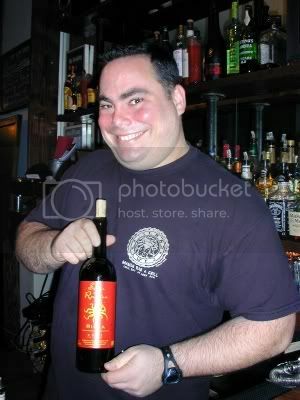 Now, I don’t want to imply that there is any collusion between the distributors and our friendly regulators, but on Wednesday night, just before the strike ended, there were at least 30 raids in bars in Manhattan and one of the things being checked was whether or not any “non-authorized” liquor was being sold. Apparently several bars had resorted to trying to circumvent the iron grip of the distributors by buying elsewhere, and they got caught. Another very enjoyable day. The weather took a turn for the colder but it was an invigorating cold, not that nut-numbing stuff my friends in Minnesota were experiencing. I hit 3 bars for the day bringing the total to 945 and leaving me 55 to go. Tomorrow I will be meeting an old friend (well, I have known her for a long time but she isn't really old just, shall we say, mature) in Hoboken and then on Saturday I am heading up to the Bronx to meet the guys I was with last time I was up there. I plan on resting the old liver on Sunday and then heading back to the Houston Street area again on Monday. There are just so many neat bars in that area. There are a lot of bars on and just around Houston so this seem like an area ripe for a few more visits. And it is convenient enough to get to by subway. It turns out that several of the bars are owned by the same guy and everyone, including the bartenders, seem to know everyone else. Well, this one didn’t really fit the mold but it was on the way from the subway to Houston as I walked along Elizabeth Street. It is at 265 Elizabeth, not far from Houston. A bar and a restaurant that is quite a bit larger than it first appears. There is an L shaped wooden bar up front with eight bar stools. The short side of the bar is next to a large window that was wide open on this unusually warm day. A little wooden bench sits just under the window sill. The bar back is a distressed wood framed mirror behind tiered shelves of liquor with stacks of glasses in front. Underneath are coolers with metal doors. The walls are patterned yellow tiles and the ceiling is a matching shade of yellow. There are large, high backed curved red banquettes against the walls in the dining area and one separates the bar from this area. The dining area also has numerous tables and chairs. Little lights with orange shades are mounted on the walls. At first glance this looks like the extent of the place but then you notice a lounge area in the back with sofas and beyond that a large covered outdoor area complete with heaters in case it ever does get cold this year. I had a glass of Hoegaarden. Another great bar on the corner of Houston and Suffolk. It could be a great dive bar but it is on a corner and a bit too big with too many windows to really qualify for that classification. Let’s just call it dive-like because it has everything else going for it including a great cast of characters and a friendly bartender. It took me forever to take my notes because everyone was so friendly and chatty, particularly when they found about my quest. I also ended up staying here longer than I had planned and had a few more pints as well. The bar is a beat-up old wooden thing with a black ledge for your feet and a brass beer station with eight spigots. The wood bar chairs have black vinyl seats that are suitably torn and taped. The bar back is old wood shelving and cabinets and mirrors. There are tiered shelves of liquor but, alas, no Jagermeister. Now this wasn’t too distressing to Bar Man but it was to one of the patrons who offered to pay the bartender to run out and get a bottle and said he would still pay for the drinks. This didn’t happen though. When you get to the point where you are making that kind of an offer you have probably had a bit too much to drink already. The walls are a combination of bricks, red plaster, and wood paneling. Ledges by the windows have bar chairs in front of them so you can sit there, have a drink, and watch the passing crowd. But there is more stuff to see inside. Behind the bar are religious statues, old suitcases, disco balls, skeleton lights, pictures of Marilyn Monroe and others, and much more. Hanging over the bar are four antique lights, each one different, that are quite elaborate. All kinds of interesting pictures hang on the walls and there is an Elvis bust sitting on one window sill and a ballerina lamp on the other. There is a pool table in the back and a centipede machine and what looks like the back seat of a car up against the wall under another couple of interesting paintings. 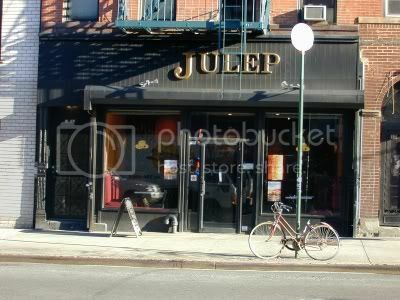 All and all this was a very nice place and they have a great two for one happy hour. I had, shall we say, a few pints of Guinness. 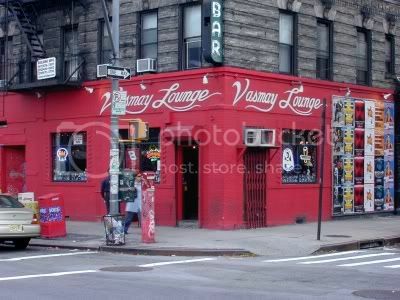 I was going to just head home after Vasmay but people recommended other bars in the area and I passed right by this one on the way back to the subway so in I popped. This is a big dark place on the corner of Houston and Avenue A. They are celebrating their 10th anniversary this month but it isn’t like the place is all decorated up for it or anything. There was some tinsel hanging above the partition that separated the bar from the dining area, but that appeared to be it. There is a long dark bar with a linoleum-like top and no place for your feet at my end. The brass rail just came to an end about half way down the bar, like someone sawed if off and moved it elsewhere. Three old brass beer stations in various shapes and sizes and all in serious need of polishing sit on the bar. The bar back is kind of a plain set of tiered shelves with a large selection of bottles in front of mirrors covered sports team pennants and photos of customers. There are ledges along the windows on the Avenue A side with stools in front. Black cushioned benches sit in front of the windows on the Houston side and tables with red and white checkered tablecloths sit in front of them A wood partition (with the tinsel hanging above it) separates the bar from that side of the room and there are more tables, also with red and white checkered tablecloths, and tables over there. It doesn’t really seem like you would go here to eat but they did have a sign on the wall advertising a Thanksgiving dinner for $19.95. There weren’t too many people in here but everyone was eating something. I gave in and ordered the calamari appetizers and it was very good indeed. Nicely crunchy and soft inside. It came with a chipotle mayonnaise that was very tasty indeed. Easily enough for two and I could only eat less than half of my portion as good as it was. I got into a conversation with the bartender, Maggie, about chipotles and my favorite brand of the canned ones, La Morena’s. It turned out this was the brand they used here. Maggie also said something about a family cookbook that, I believe, her mother was putting together and she said that was the brand recommend in that as well. It is always nice to run into another chipotle aficionado. There are a number of pictures from Reservoir Dogs along with a large poster from the movie hanging on the walls. You might be able to guess where the name of the bar comes from. I had a draft Widmer Hefeweizen and headed home. A most pleasant day with three bars hit making 942 for the year and leaving 58 to go. I had a meeting with one of the owners of Pioneer which is going to be bar number 1000 for me. 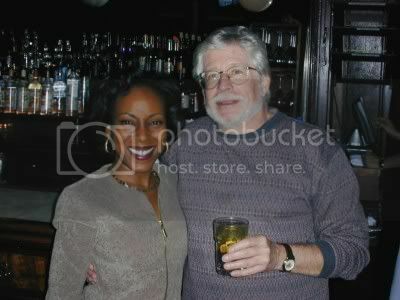 I decided to scout out the area before meeting him and found a number of neat bars in the vicinity. On the little stretch of Great Jones is this relative newcomer. The bar is in the front half of this fairly narrow place and the dining area is in the back with the open kitchen back further still. The bar has a dark wooden top with a black front. The bar chairs are light wood. There is an interesting beer station, brushed metal that kind of looks like a small barrel mounted sideways on a fat cylindrical base. Only three spigots though. Lots of beer glasses are stacked next to it. Cooling units with metal doors and a small wooden wine rack sit behind the bar with tiered shelves of liquor, a bunch of wine bottles, a red cash register and shelves of glasses sit on top. Lots of little metal cocktail shakers, individual portion size, sit there too. A bit of a cluttered look. There is a wooden shelf built above the clutter and it holds their fancier stuff along with an assortment of small gourds. A modern looking narrow rectangular wood framed mirror sits above that shelf. Blackboards on each side of the shelves list the wine and drink specials. A large cylindrical clear glass vase surrounded by more small gourds sits on one end of the bar and holds a large spray of branches covered with dark green leaves. Opposite the bar are a row of small tables in front of a long wooden bench with an oxblood colored cushion. Bar chairs sits on the other side of the tables and a few more chairs sit in front of a ledge on the wall next to the door. There is a small round table with two chairs on the other side of the dore. The walls are pale green as is the ceiling and the floor is wood. The light mounted on the ceiling above the bar is an oblong pale green Lucite box in a wooden frame and the same size and shaped light is mounted on the wall opposite the bar above the bench. I had a draft Schneider Weiss and my only complaint was the price, $8.37. A bit much for a beer that usually goes for five bucks. I guess I can’t recommend this place for someone just popping in for a drink but the people eating here seemed to like the place. The real deal when it comes to dive bars, including the boisterous, tipsy crowd singing along to the juke box. And its only early afternoon. 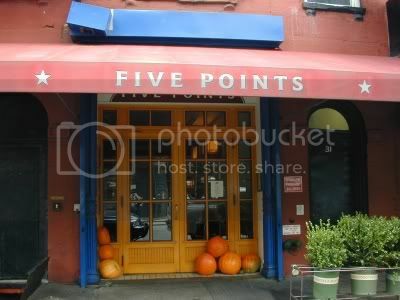 It is at 51 Houston Street, just about where it intersects with Bowery. I think this might be the cathedral of dive bars. It even has cathedral like stained glass lights hanging from the high patterned black tin ceiling. It also had the requisite old guy mumbling to himself at the far end of the bar. And the bar is a classic old beat-up wooden one with a raised front ledge to keep the spilt drinks from running onto your lap. And, like every good dive bar must, it has a rack of snacks; pretzels, popcorn, chips, behind the bar. The bar back looks positively ancient and it might very well be. This place is reputed to have been established in 1880. There are old coolers and cabinets with beat-up wooden doors, tiered shelves of liquor and sagging shelves loaded with large and small bottles. 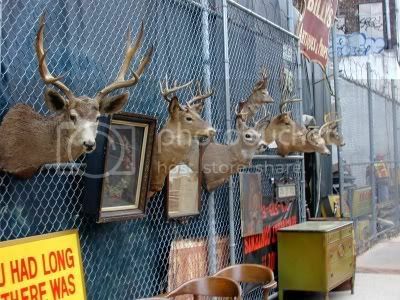 Every inch of wall space is covered with everything from old Coca Cola signs to a large yellowing picture of a young Frank Sinatra mounted on the head of a base drum. All kinds of photos of customers, sports figures, Marilyn and Joe, movie posters, photos of politicians, you name it and it is on the wall somewhere. The front window and the back wall are covered with neon beer signs and they seem to provide most of the light, of which there isn’t much. All and all a great place and I give it a three thumbs up. If you like to sing along with Working Class Hero and Whiskey River, or just like to listen to other people singing along, this is certainly the place for you. I had a bottle of Red Stripe. Right next door to Milanos and up a flight of stairs is this decidedly different type of place. Not fancy, but certainly no dive. It is as comfortable as your grandmother’s kitchen, but with a decent sized and nicely grained wood bar and wooden bar chairs. A globe sits on one end of the bar. 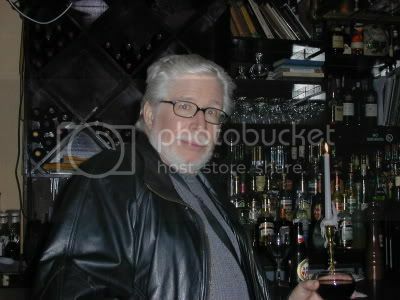 A set of black iron pipe and wooden shelves in front of a mirror behind the bar holds the liquor, glasses, and a decent sized television. Overhead fans and inverted spider-like metal light fixtures with small bulbs hang from the pale green ceiling. The spiders all seem to be missing one leg though. The walls are a bit deeper green than the ceiling and are mostly decorated with grade school class graduation pictures. Somewhat of a bizarre concept but what was really strange was that one of the pictures was from the 1977-78 Barton Elementary School in Minneapolis. Now Bar Boy grew up in Minneapolis but never went to that school. Damned if the name of the teacher, Mrs. Halverson, doesn’t ring a bell though. I will have to ask my friend, Donna, who retired from the elementary school system in Minneapolis and who I have known since first grade knows why this might be the case. The flooring is wooden planks and small tables and chairs line the walls with a wrap-around bench up front by the windows. A couple of large green chalkboards list beer and wine specials and advertises their Boozy Blue-Grass Brunch on the weekends. One chalkboard had a riddle, a variation of the “this man’s father is my father’s son…” written on it. I ordered a glass of the house red but they were out of it so the bartender, gave me a better wine that he liked for the same price. He poured me a glass and then poured a little sip for himself. He wasn’t happy with it though. He said that particular wine didn’t last long after it was opened so he opened a fresh bottle and poured me a fresh glass. I was quite good and I appreciated his gesture. I probably wouldn’t have known that the first glass was a bit off. The wine I had was Spanish and I thought it was Solar de Raudez, but I can’t seem to find any information on it. If anyone knows what I might actually have had, drop me a note. 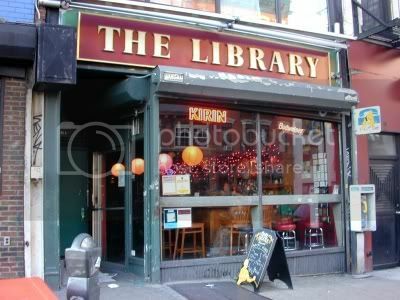 Located at 288 Elizabeth Street this is a good sized place with a large screen on the wall in the back and where they show movies at night. 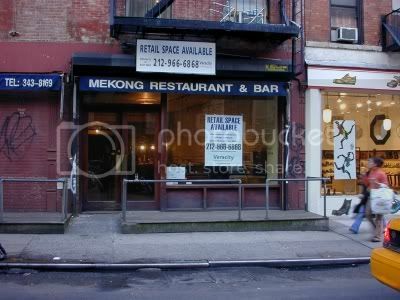 Interestingly, both the bartender, Isabel, and her friend Vicky, used to work at a bar down the street a bit, MeKong, that I had visited earlier in the year but was now closed. They also both knew the guy, David, that I was going to meet later at Pioneer. Life is just full of coincidences today. For some reason neither of them wanted their picture taken though. Same with the bartender at Milanos who actually covered her face when someone else popped in to take a picture of the interior of the bar. The bar is long and wooden with a black foot rest. The bar stools are black metal rods with round black vinyl seats that spin. The bar back is brown wooden shelving with bottles and glasses and large amounts of crockery on display that all has “Tom & Jerry,” or “Tom and Jerry,” or “Tom n’ Jerry,” or some other variation thereof embellished upon them. There is a large mirror with an ornate gold frame above the middle section of the bar back. The wall opposite the bar is mostly glass brick between sections of concrete wall. There are neon beer signs on the front window. Lots of small tables and chairs line the walls. Spot lights hang from the black ceiling and there are a couple of overhead fans. Kind of a dark distressed tile floor. Looks like it would be a fun place to hang out when the movies start. I had a draft Widmer Heifweizen, a European style white beer that is brewed in Portland, Oregon, and then headed over to see where Pioneer was so I could come back later when it was open. On the way to Pioneer I passed by a place that I thought was named Porcupine and popped in just to check it out for a future reference. The people were very friendly so I figured I would stop back with the Mysterious Chinese Woman later on for dinner before looking up David. Well, I did come back to what I thought was Porcupine only to find out that it was now Jacques. For some reason the owner decided to change the name just a couple of weeks ago and make it more of a French bistro. Damn, I should have hit this earlier so I could have gotten a twofer. The bartender said the interior hasn’t changed that much but it certainly seemed to have that French bistro feel to it. In fact, even this late in the year, there were people sitting at outside tables. There is an old wooden bar with a brass silver foot rail. The chairs are dark wood. The silver T shaped beer station had spigots with stubby unmarked black handles. Wooden mirror backed shelves held a decent selection of liquors. Globe lights hang from the tiled ceiling and two of those upturned spider like fixtures with clear bulbs and orange glowing filaments hang over the dining area. Clear glass bulbs with orange glowing filaments must be the new style because you see them everywhere now. The lights mounted on the walls have the same type of bulbs. The walls are kind of like cream-colored plaster with mirrors and windows looking out to nowhere mounted on them. Lots of little framed posters and pictures and one large poster on the wall next to the bar that I really liked. The floor is multi-colored tile and there are dark red banquettes and tables around the walls. After my drink at the bar The Mysterious Chinese Woman and I had dinner and I must report that it was great. We had grilled octopus for an appetizer and it was delicious. I had the flank steak, done to perfection, with French fries and the Mysterious Chinese Woman had hake and it was also great. Certainly a place worth returning to. 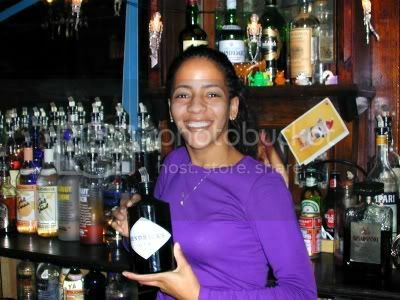 I had a Bombay martini, up with a twist, at the bar and then headed to Pioneer. After meeting with David at Pioneer, a most pleasant person who seemed really excited about it being the 1000th bar I headed home but popped into Tom & Jerry’s for a night cap and to see what was showing. We managed to catch the ending of Psycho. I also want to say that Pioneer looks like a perfect place for a party. It is quite large with a good sized front area and bar and another big bar in a large back room with a pool table. I think number 1000 should be a real blast. A very productive and enjoyable day with five bars hit bringing my total for the year to 939 leaving just 61 more to go. Hurry, Hurry, they are going fast, only about 932 left. I will even autograph it for you. Now, I am not suggesting that this is the best use of your dollar, but what the hell. After taking the weekend off I decided to just stick close to home today and check out bar that I haven’t been to for a long time, and for no good reason. This bar, at the intersection of Hoyt and Bergen, is a real find in my neighborhood. 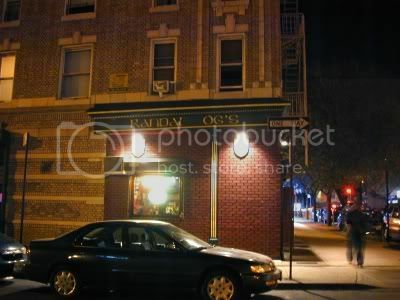 Just a block off trendy Smith Street sits this venerable and somewhat overlooked gem of a neighborhood bar. A classic old wooden topped bar with a protruding wooden arm rest. The front is elaborately carved dark wood with a narrow foot rest. The bar chairs around the bar and the stools around the walls, some with ledges for drinks, are the only things in here that look new. The chairs have black metal legs and black vinyl seats and backs. The stools have shiny tubular legs and round black vinyl seats. 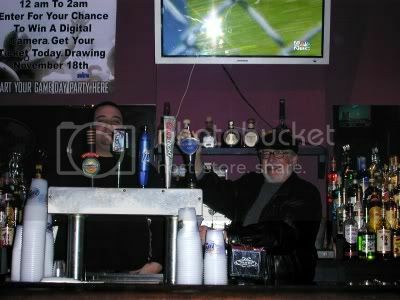 There are two silver beer stations on the bar, one with six spigots and the other with two. Hanging over the bar are old milk glass light fixtures that give off a warm orange glow but not a great deal of light. Behind the bar are old wooden cabinets, some with small glass windowed doors, and drawers, all with brass handles. Two sets of tiered shelves on top hold the liquor with the silver cash register between them. Panels of mirrors go almost up to the ceiling but end at a slightly arched dark wood decoratively carved panel. To the left is a dark wood panel that looks like it could be the back of an elaborate breakfront. It has three small square mirrors topped by two larger rectangular mirrors flanking an old, intricate stained glass panel that is lit from behind. The walls here are all dark wood paneling except for the back wall in the back room which is a dark rose. There is a pool table in the back room under three old lights. Three stained glass panels are mounted on the archway separating the front bar from the back room. One has the letter H on it and the other the letter N. Nobody seemed to know what they stood for though. The ceiling is patterned brown tin and, in addition to the lights over the bar, has old-fashioned fans hanging from it. The floor is old wood. Wrapping around the two sides facing the street are large paneled windows. This is a classic old Brooklyn neighborhood bar and I highly recommend that if you are visiting Smith Street, or even if you aren’t, you do yourself a favor and pop in. It is close to the subway too. I had a draft Dentergems, Wit, a Belgium beer that was a bit spicier than many. It was quite good. A lazy day but an enjoyable one. Just one bar hit with 66 left to go.